Home / Columnists/ Authentic leaders: Are they here? Authentic leaders: Are they here? 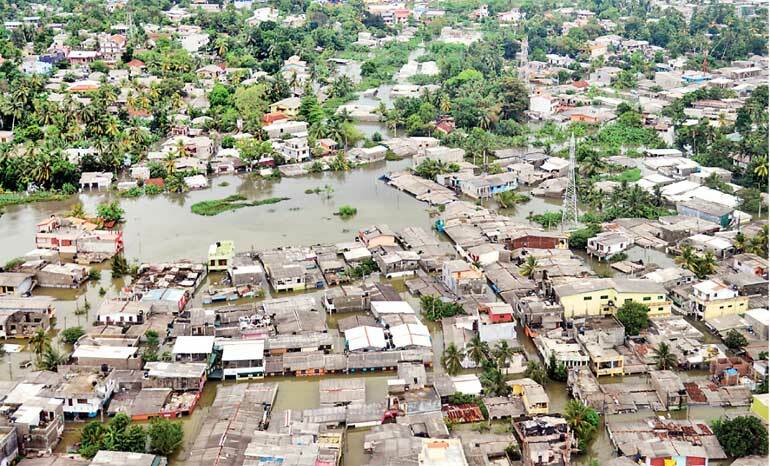 We still bear the brunt of a brutal natural disaster. Vesak just ended, awakening us on becoming more humane. It was heartening to see the spirit of humanity in action where thousands of needy were offered a helping hand. Surely it is not over and perhaps just a beginning of a more robust plan for better disaster management. I am so sad to witness the Lankan tragedy while in Oklahoma, USA, where one of the best weather forecasting centres is located. All of these prompted me to get back to my preferred area of leadership. This time, it is on the rare breed of authentic leaders. Leadership literature is full of fancy jargon and a multitude of packaging as well as re-packaging. One significant trend in the recent past in the East and West alike is the focus on authentic leaders. As we are aware, leadership is all about inspiring, influencing and instructing. It is more than positions and titles as it involves decisions and actions. What is the specialty of authentic leadership? Let’s discover. Authentic leaders have always been there in the world. All great religious leaders are obviously authentic. From Jathaka stories to the Bible, many such examples could be found. Yet, as in most of the cases, the real packaging was done in the West. The concept of authentic leadership was made popular by Bill George in 2003. 1. Authentic leaders are self-aware and genuine. Authentic leaders are aware of their strengths, their limitations, and their emotions. They also show their real selves to their teams. They do not act one way in private and another in public; they don’t hide their mistakes or weaknesses out of fear of looking weak. They also realise that knowing themselves better is an endless journey, never complete. 2. Authentic leaders are mission driven and focused on results. They are able to put the mission and the goals of the organisation ahead of their own self-interest. They do the job in pursuit of results, not for their own power, money or ego. 4. Authentic leaders focus on the long-term. A key tenet in Bill George’s model is the company leaders are focused on long-term shareholder value, not in just beating quarterly estimates. Just as George did as a CEO of several leading business organisations, leaders realise that to nurture individuals and to nurture a company requires hard work and patience, but the approach pays large dividends over time. I was contemplating what Bill George attempts to say. For me the key is authenticity. It comes from being ethical and effective. What could be an appropriate way to connect Bill George’s authentic leadership with what we need to do? 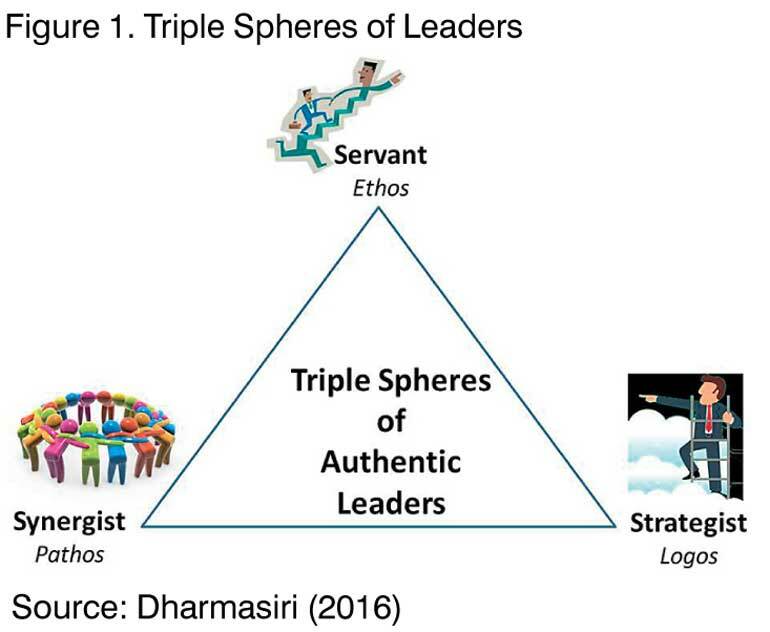 I propose triple spheres for leaders to depict their authenticity. I propose for a leader to be authentic, he/she should strive on three spheres, in simultaneously being a servant, synergist and a strategist. It is very much linked to Aristotle’s model of leadership where he spoke of ethos, logos and pathos. (I must acknowledge the fact that it was Dr. Travis Perera, my senior colleague at PIM, who shared this thought with me initially). We have often discussed the need for a leader to be a servant. It goes with the maxim that those who serve deserve leadership. It was Robert Greenleaf who “branded” the concept of servant leadership. “The servant-leader is servant first. Becoming a servant-leader begins with the natural feeling that one wants to serve, to serve first. Then conscious choice brings one to aspire to lead.” That’s how Greenleaf described servant leadership. This fits to the Ethos dimension of Aristotle. It means good character, proper sense and right will. Authentic leaders should be willing to serve in a genuine manner. We find many such examples from multiple fronts. From the religious front, Mother Theresa devotedly demonstrated the dedication towards deserted children. From the business front, Jan Carlzon of Scandinavian Airlines (SAS) is a fitting example where he upheld service at all levels. “We have 50,000 moments of truth every day,” said he at the beginning of the successful SAS turnaround, referring to every time an employee of the company came into contact with a customer. A leader needs a team in order to move towards a shared dream. It is not being autocratic but democratic, not being coercive but collaborative. World of sports have many such examples where leader harnesses a winning team. Authentic leaders have to awaken the team spirit in fostering synergy. Leveraging on strengths of each team member, the leader can collectively do more. What Mahatma Gandhi demonstrated in rallying a nation with non-violence against a forceful empire is this reality. He was a true synergist and the community, even while he was in jail practiced what he preached. This is where the head comes before heart and hand. Crafting and executing “the game plan” of the organisation is what an authentic leader should do. It reminds me of a brilliant book I read so many years ago, titled ‘Mind of the Strategist’. Kenichi Omae vividly depicts the triangle consisting of company, customer and competitor. Siting many Japanese business successes, he highlights the need to be sharp and specific. “Rowing harder does not help if the boat is headed in the wrong direction,” said he. The best way to take the discussion on authentic leaders forward is to be one of them. Authentic leaders are in high demand, locally and globally. Instead of being unethical, unfair and untruthful, what is acutely required is the authenticity. Operating in triple spheres as a servant, synergist and a strategist is what one should do. Perhaps the natural disaster we are currently facing could be a wakeup call for managers and administrators at all levels alike to think and act like authentic leaders.